We personally chose to visit because after a few trips overseas in the last year we really wanted to spend some time relaxing without flying and be able to take along the third (and most important) member of our family, Evie our Cocker Spaniel. I love going away but hate having to leave her so this time around the hunt was on for a place that all three of us could enjoy! Plus when it comes to dog friendly then Cornwall wins a place very high on the list. With an abundance of gorgeous locations to choose from in this area we finally plumped for a spot fairly central on the Cornish Coast, near Holywell Bay and just a few minutes drive from Newquay. As you can see from the photos the beaches in this part of the world are just beautiful and what's more are all incredibly dog friendly. Evie, having only seen the sea briefly once before on a rainy day trip to Brighton, soon fell in love and found her paws gallivanting around the sandy shores. She got braver by the day and by the end of the week was happily strutting her stuff and confidently wandering up and into the sea - a feat that at first she found incredibly daunting! 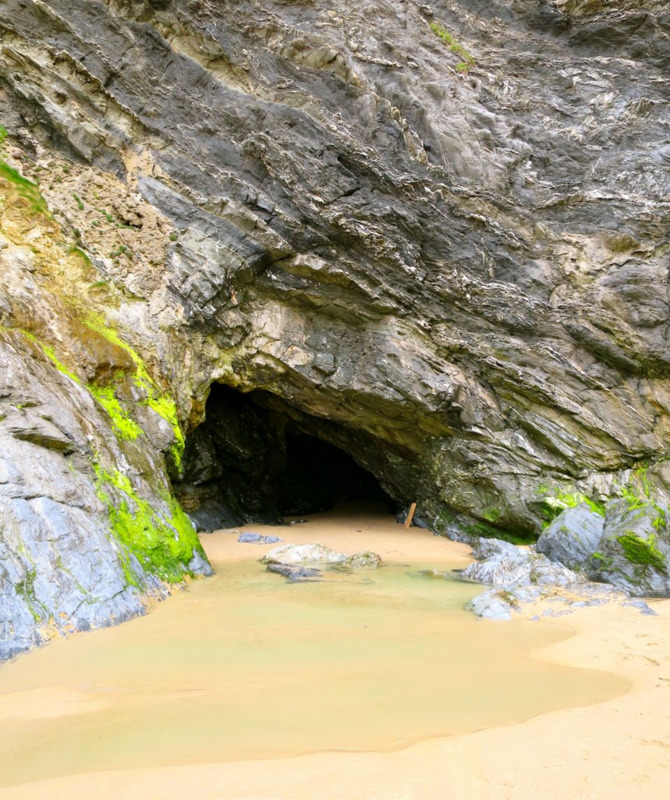 This particular beach, shown in these first few photos, is called Perranporth, is dog friendly (must be on leads between July and August 9am-5pm) and is really just absolutely beautiful. The town of Perranporth is also really very lovely with an abundance of places to chow down on local fish and chips, cream teas and of course the delightful Cornish pasty! We purchased a beef and stilton pasty from the local butchers on the way down to the waterside and sat on some rocks and ate it as we took in the sea air. Perfect. Perranporth also has another claim to fame (of sorts) in being the only place in the UK to have a bar on the beach! The Watering Hole is a great little stop for a pint of Doom Bar or Tribute on the beach after a long and hearty dog walk by the sea. Also I imagine it's a great spot for sports enthusiasts to stop by and watch the game with a plethora of indoor space and TV screens, plus live music in the evenings. Worth a stop if you get the chance. Just watch out for the seagulls who won't think twice about swooping in and flying off with the majority of your chips - much to the amusement of the local clientele! Now when it comes to accommodation, Dan and I chose to stay in a self catering, dog friendly cottage. Ideal for this sort of holiday especially if, like us, you enjoy buying in local produce and cooking lovely home baked meals and lighting up the barbecue. We booked with a company called Unique Home Stays having previously stayed in one of their beautiful properties in Devon a few years ago. Billed as luxury self catering, it will set you back a few more pennies than perhaps your usual holiday rental. You will however get exactly what you paid for and we have certainly never been disappointed. In fact the properties that we've stayed in, alongside the smooth running of the company and the hospitality of the owners, have always exceeded our expectations. Plus one real bonus is the number of dog friendly properties that they have on their books. It's so nice to be able to stay somewhere so very lovely that is also happy to allow your furry friend to join you. This time we stayed at the Old Pear Tree Barn, just 20 minutes walk away from the beautiful Holywell Bay. Amenities wise you get everything you could need and more. You arrive to a stunning picnic hamper full of local goodies (yours to keep) as well as a selection of local breakfast delights to help get you on your way the following morning. Fresh bread, eggs, bacon, sausages, mushrooms, milk etc. The properties are beautifully maintained and full of all of the home comforts you could wish for in order to have a really relaxing holiday. 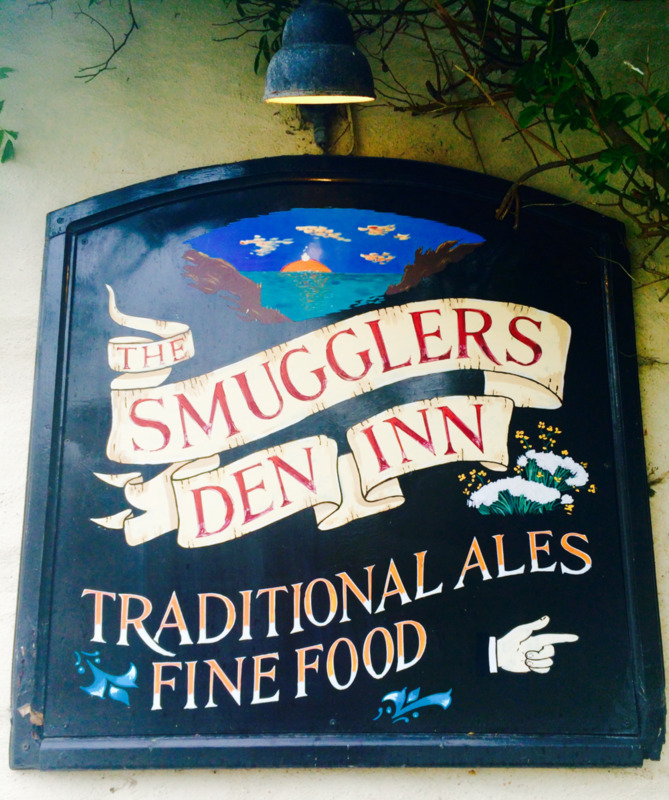 About ten minutes walk from Old Pear Tree Barn is a super local pub serving some of the most delicious food - The Smugglers Den Inn. Originally a tavern for exactly what its name suggests, a smugglers den, this lovely local is now a very dog friendly local stop that is well worth a visit. 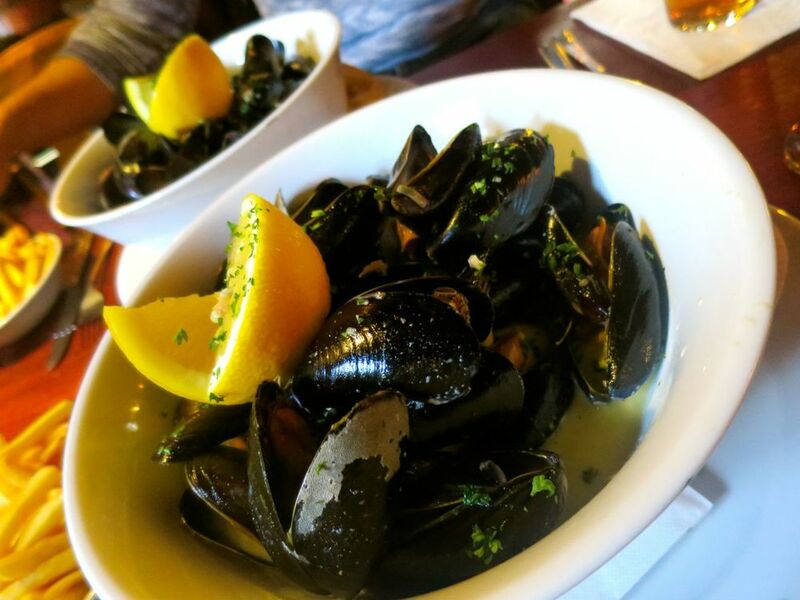 The food is sublime - try the Steak, Smoked Bacon and Blue Cheese pie or if you want to get your hands on the biggest bowl of local mussels you'll probably ever witness then dig in to the Moules Mariniere and I promise you won't be disappointed (full for the rest of the week, but not disappointed!) If you do ever venture this way then make sure you say a big hello to the beautiful, wise and calm resident Golden Retriever, Alfie! Now on to the aforementioned Holywell Bay. This mile long beach is another totally dog friendly destination and come rain or come shine is a great spot for some outdoor activity and a stroll along the beautiful shores. We walked there from our cottage, about 20 minutes across some fields and farm land, and then spent the afternoon on the beach, in the drizzle on a slightly greyer day, having a fantastic time exploring the coast line, caves and the general seaside beauty of rugged cliffs and natural sand dunes. Another top pub mention must come in here. St Pirans Inn is a really nice spot to stop by for a pint after a long afternoon walking on the beach. Friendly staff and happy to accept your wet, sandy dog even in the bar area, this is also worth a moments break. We didn't eat here so I can't comment on the food but it was a lovely welcoming place for a well earned pit stop on a Sunday afternoon. So to the final stop in todays post and the first instalment of my Cornish adventure. A purposeful pit stop to take in that well known delight, the Cornish Cream Tea! Now you won't be short of options when hunting down this local indulgence as there's an abundance of choices in each and every village and town. Yet after a little Google time we sought out a lovely spot just near Newquay where we could walk the dog then eat our sweet treats with a spectacular view of the Atlantic crashing against the coast. We jumped in the car and took a short drive to the Pentire Headland where we took in the beautiful views before stopping at Lewinnick Lodge for a bite to eat. This stunning place to stop is also completely dog friendly, tick. Plus is a perfect place to sample some hearty food - huge Fish Finger Sandwiches, Cornish Yarg Toastie and Cream Teas - tick, tick and tick! And so that concludes my first post about this lovely trip to beautiful Cornwall. I have so much more I'd like to share - I'll try and condense for your enjoyment and hope not to bore you too much! Plus I was also lucky to meet with an organic skincare company whilst there whose products I'm currently giving a test run. I'll be posting a little bit more about what they do and my thoughts on the products in a separate post coming soon so if that's something that interests you then keep your eyes peeled for that. Have a lovely day all. I hope this post has inspired you for your next trip away and if you already have a holiday planned to this area then I hope some of the recommendations come in handy.